Have you always believed English is illogical and inconsistent? In this workshop your understanding of English will be transformed! Award-winning author Denise Eide will reveal phonograms and spelling rules which explain 98% of English words. No longer will you need to tell your students “that is an exception” when they misread or misspell a word. The rule which explains the two sounds for C in accent and describes more than 6,000 words! Three of the nine reasons for a Silent Final E.
Why many math and science minded students struggle with reading and spelling. Why we drop the Silent Final E in servicing but not in serviceable, and much more! Do not miss this revolutionary workshop. You will leave wondering why someone didn’t tell you this in kindergarten. Closing the achievement gap in reading requires teachers across the curriculum to integrate reading instruction into their classrooms. This is best accomplished with a unified approach to reading K-12, where teachers in later grades reinforce the concepts learned in K-2. It also requires all teachers to have an understanding of how words are read and spelled and be able to answer students’ questions about words. In this workshop we will demonstrate how knowing the logic of English will aid in teaching reading, introducing vocabulary, and improving spelling. This workshop is for both teachers and administrators and will provide practical ideas and knowledge about reading instruction. Educators will leave the workshop with a new understanding of how English works and how this knowledge matters in their classrooms. Are you tired of drilling the Dolch Sight Words, yet cannot think of another way to handle the countless exceptions to English? Look no further. In this hands-on workshop, participants will discover the answers to their questions about English spelling and through this process discover a way of teaching reading that does not rely on the kill and drill of sight words. During this workshop, participants will gain critical thinking skills for language learning as well as develop a deeper understanding of why so many students struggle with reading and spelling. Teachers will leave empowered to change their schools and communities with the knowledge of how English works. Reading and Spelling Games Galore! Learn how to incorporate more games, movement, and fun into teaching reading and spelling! In addition to learning numerous games to enhance reading and language arts instruction, participants will discover the kinesthetic components of reading and writing and how to tap into these to enhance learning and speed up mastery. Though this workshop will focus on reading and spelling, the concepts are easily applied to other subjects. Each participant will receive a handout of games and ideas that can be used on Monday! Do you want to help your students develop better tools to quickly master academic vocabulary? In this workshop you will discover how learning the meanings of roots, prefixes, and suffixes will transform vocabulary development, spelling, and reading. Participants will not only discover how English words are built, but they will leave with practical ideas for integrating this information into their classrooms. 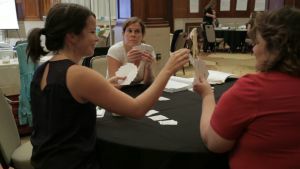 While exploring the structure of words, we will play games, demonstrate how to introduce words found in history, math, and science, and discover how fun learning vocabulary can be. You will leave this workshop inspired and hungry for more. Each participant will receive a detailed handout that can be used with students of all ages. Phonemic awareness is the foundational skill of reading, yet too often in reading curriculum this skills is limited to rhyming. 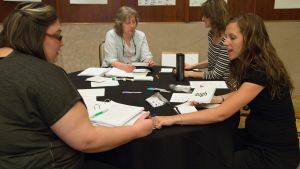 Denise Eide will demonstrate the steps to developing strong phonemic awareness skills and present games and activities for student practice. During the workshop, participants will practice teaching the skills through hands-on activities. 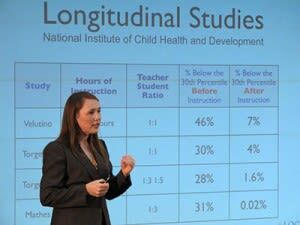 This workshop includes pilot study data on phonemic awareness development. 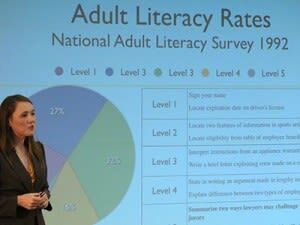 Many educators feel confused about how to best teach reading. Should I begin with phonemic awareness, phonics, sight words? How are skills related? 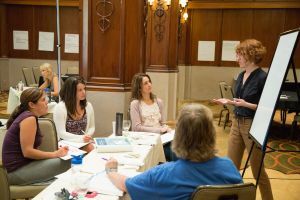 In this workshop, participants will develop a deeper understanding of the five strands of reading: phonemic awareness, systematic phonics, fluency, reading comprehension, and vocabulary and how each one plays a vital role in developing strong readers. 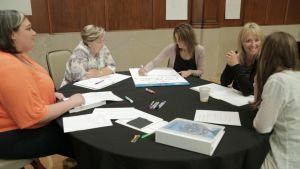 In addition, educators will learn helpful ways to understanding the interaction and development of each of these strands and how to incorporate them at various levels of student development into their instruction. 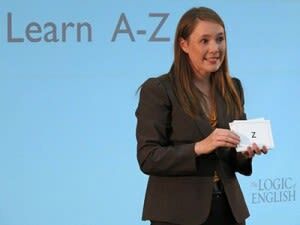 Spelling Analysis is a technique developed by Logic of English to teach students how and why English words are spelled in a particular manner rather than asking students to memorize spelling by rote. Spelling Analysis can be used to teach the spelling of any word. 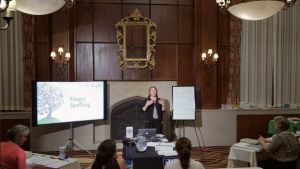 In this workshop, participants will gain greater insight into the power of spelling analysis, have practice teaching this powerful technique, and experience the benefits of this method as students. Reading and spelling are complex skills that involve the mind, muscle memory, learning styles, and the heart. Join award-winning author Denise Eide as she opens your understanding to why many students struggle. Practical information will be interwoven with stories from her own experiences. She will also share NIHCD research that demonstrates the power of systematic, multi-sensory teaching for all students. Why oversimplifications, such as teaching S says /s/, discourage math and science minded students. * How to correct reversals. Ways to teach to the strengths of visual, auditory, and kinesthetic learners while strengthening their weaknesses. 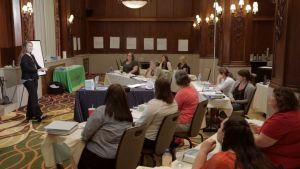 This workshop will lay the foundations for teaching reading and spelling, aid teachers in selecting curriculum, and help teachers heal and guard their students’ hearts from discouragement. Developing fluid, legible handwriting is foundational to education, yet this basic skill is often neglected in today’s world of computers. 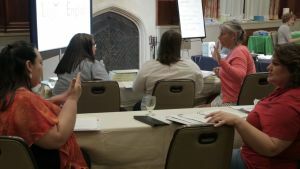 In this workshop we will explore the history of handwriting education, methods for teaching handwriting so that all students succeed, handwriting games and practice ideas, best practices for teaching cursive and manuscript, and more. 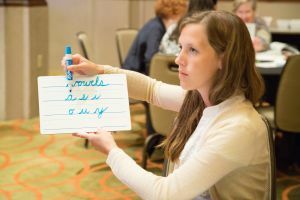 Participants will also learn the latest handwriting research and how it applies to teaching reading and spelling. This workshop is designed for early childhood professionals. Learn how to smooth young children’s transition into learning to read by providing early exposure to phonemic awareness and accurate information about phonics. This workshop will present language learning games and ideas on teaching the phonograms to young students. Each participant will receive a handout for ideas they can use in their own classrooms. Copyright Denise Eide, deniseeide.com. All rights reserved.